As I discovered in the waning evening light below camp, some pools were full of both salmon and brown trout following the bounty of eggs. Assumedly the trout would soon do their own spawning activities. That camping trip will live on in my memory as one of the all-time great trips. The next morning after the catching extravaganza, my goal was to scout a bit more of the stream to see if there were more runner browns in the system. Starting early in the morning at the same pool as the evening before, I managed a few more brown trout as well as a surprise lake trout thrown in for good measure. Some days you just never know what to expect on the other end of the line. The cold was still of the bone-chilling variety so I kept fishing instead of stopping to eat breakfast. A few chips and a cold bagel provided enough energy to stay focused. Moving upstream from camp, I came across a deep pool with a nice rock ledge on the far bank near the tail out. Wonder of wonders, a sizable brown was lying right on the rock ledge just like the browns always do back home in the Smoky Mountains. 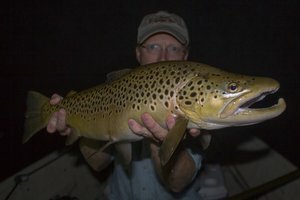 While I was watching a much larger brown darted out from some unseen hiding place and blended into the depths until I wasn't sure if I had really seen it in the first place or if it was an early morning vision generated by my hopes of finding a big trout. Looking up higher in the pool, I noticed a classic sandy bottom. Fish do not often sit on these spots because they are so easy to see but when they do you can usually catch them. Suddenly my eyes must have bugged out just a bit, because there wasn't just one or two, but a whole row of fish finning at the bottom of that deep hole. 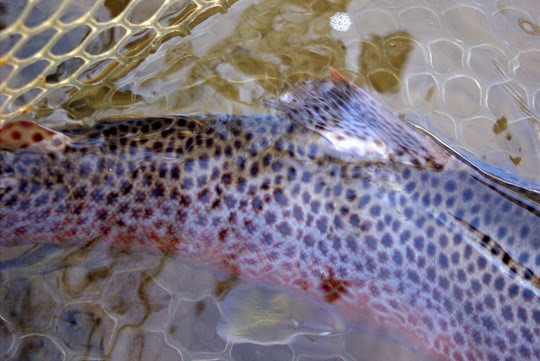 A second examination confirmed that they were definitely not salmon moving up and were probably, in fact, brown trout. 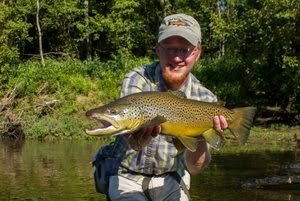 The big streamer was soon flashing back and forth with me ducking a little on each cast for safety. I plopped it into the water and started swimming it around and....nothing. Maybe they are resident fish. The runner fish seemed much more aggressive towards streamers while resident fish are much more wary, having spent their whole life avoiding predators in the stream. Lake fish tend to have less fear, having dwelt at great depths where they are generally safe from most predators. I quickly changed my rig to a big stonefly with an egg pattern trailed behind. Maybe they are watching for eggs from the salmon spawning upstream. An indicator completed my rig, and then I was back casting to the fish who were now onto me. 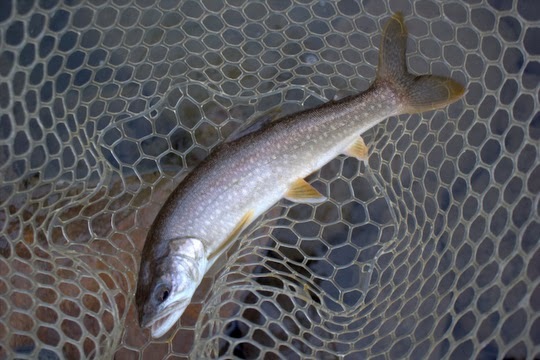 One trout in particular was still sitting out though. Just a little behind and across from a large boulder, I suspected that it would eat given the proper drift. The current was tricky and definitely not conducive to an easy presentation. However, with enough trial and error, the correct line was soon discovered. Hitting that line was also tricky, but finally everything came together. 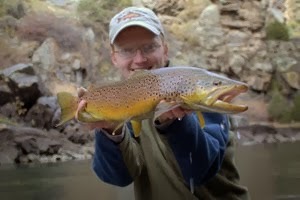 The big brown moved four feet to inhale one of my offerings, the indicator twitched, and I set the hook. Immediately the fish went ballistic, running all over the pool before heading towards the faster water downstream. Resigned to losing the fish, I gave chase but without hope. Any minute the fly should pop free. Then I started to gain some line. Okay so there's a chance. The moment I slipped the net under that trout was almost a miracle. 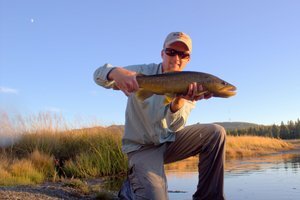 I rarely have such pessimism about losing a trout as I did with that fish, but everything came together for one of those moments I'll always remember. 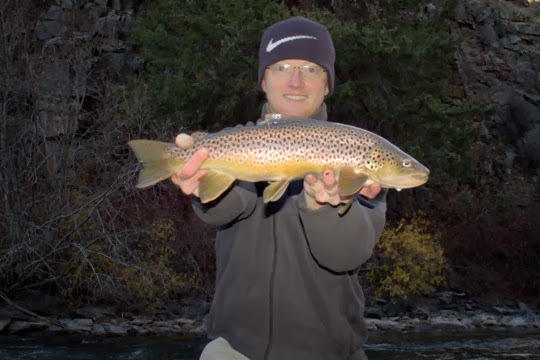 Definitely not the largest trout I've ever caught, not even close, this fish was memorable because I had worked hard, going through flies, changing tactics, until I found the one that would work on that fish. The colors were amazing. 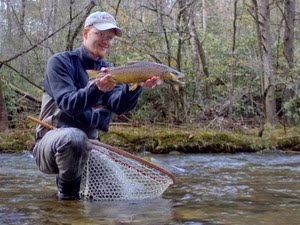 The flash in the picture above dull the colors but the net shot below shows the richness of the golden brown hues along the trout's sides. Amazingly, my weekend trip was not over and would get, if possible, even better. Stay tuned for the rest of the trip coming up soon! Largest or not, we'll take one that size any day. Thanks Bill. I wish I always had the necessary patience but I'm encouraged with trips like this. Exciting, David, great post with good detail. Persistence pays off if you stick with it. You did that for sure. Thanks for showing us "OL Geezers" what we have to do get our "Game" on! Thanks Mel. I was definitely excited! Thanks David, it was for sure. David, I'm jealous. What a wonderful sounding trip. I certainly hope that my life settles down and allows me to hook up with you when the weather is more greezer friendly. You're living the life. Howard, we definitely need to make this happen. Let's fish soon!